Global marketing automation specialist dotmailer has been confirmed as the final event partner for eCommerce Show North, the biggest ever gathering of eCommerce companies, vendors and suppliers to be held outside London. We're therefore delighted to be able to say that, with exactly a year to go, the event has secured a headline sponsor in UKFast and all four available event partnerships have now been taken, by Endless Gain, Space48, Digitl and now AIM-listed dotmailer. 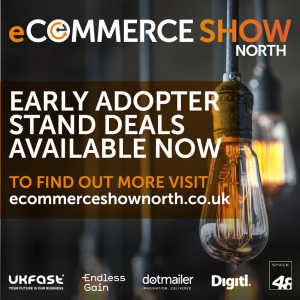 Martyn Collins, director of eCommerce Show North, said: "We're delighted to welcome dotmailer as our final event partner, joining UKFast as lead sponsor and fellow event partners Endless Gain, Space48 and Digitl. "It is testament to the vitality and importance of the eCommerce sector in the North that we have been able to secure such strong partners a full 12 months ahead of the event."